Aliaume Damala Badara Akon Thiam is an American rapper, record producer, songwriter and a businessman born on 16th April 1973. He was interested in music since his childhood and as a child, Akon learned to play five musical instruments including guitar and drums. With the passage of time he increased his exposure in singing and finally in 2004 Akon released his solo debut album, Trouble. The album earned critical acclaim and the singles like Lonely and Locked Up bestowed him with fame and success. In 2006, he released his second album called Konvicted which peaked at number 2 on the Billboard 200 and spawned some hit singles including Smack That and I Wanna Love You. Later on, Akon released his third album, Freedom in 2008 which generated four singles: I’m So Paid, Beautiful, Right Now (Na Na Na) and We Don’t Care. The album as well received success at the Billboard. His next upcoming album is Stadium and in January 2015 he released five singles from this album. 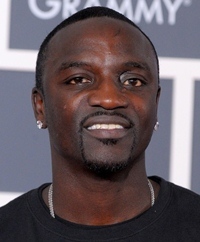 Akon’s efforts in music industry are appreciated and he was bestowed with numerous accolades such as World Music Award, MTV Europe Music Award and Billboard Music Award. Furthermore, he also appeared in a few films including Black November and American Heist. Moreover, being a philanthropist Akon formed his own charity organization with the name of Konfidence Foundation. In 2014, he as well began a project called Akon Lighting Africa which supply electricity in 15 countries of Africa. As far as his personal life is concerned, Akon told in an interview with Blender that he has six children from three different women with whom he has great relationships. You can find the complete rapper Akon body measurements details below including his height, weight, chest, biceps, waist and shoe size. Akon can also sing in Hindi, Spanish and Tamil. He is master in playing different musical instruments including Djembe and guitar.